Home Sustainability	How many planet earths would we need to sustain us in our current lifestyles? How many planet earths would we need to sustain us in our current lifestyles? This is taken from our spring 2015 issue. | Subscribe in time for the summer issue and three more. Our planet provides everything we need to flourish. However, since the 1970s humanity has been consuming natural resources at a rate that exceeds the Earth’s capacity to sustain us. It is estimated that to support everyone’s current lifestyle globally we would need 1.5 planets. There are, however, significant differences between rich and poor countries; if we all lived like an average American we would need five planets. According to WWF’s Living Planet Report, Ireland has the 14th largest eco-footprint in the world. An Ecological Footprint is measured in global hectares (gHa), the area of productive land and water required to support our consumption and deal with our waste. To communicate the impact of this in an easily understandable way, our footprint can also be represented by how many planets would be needed to support us. 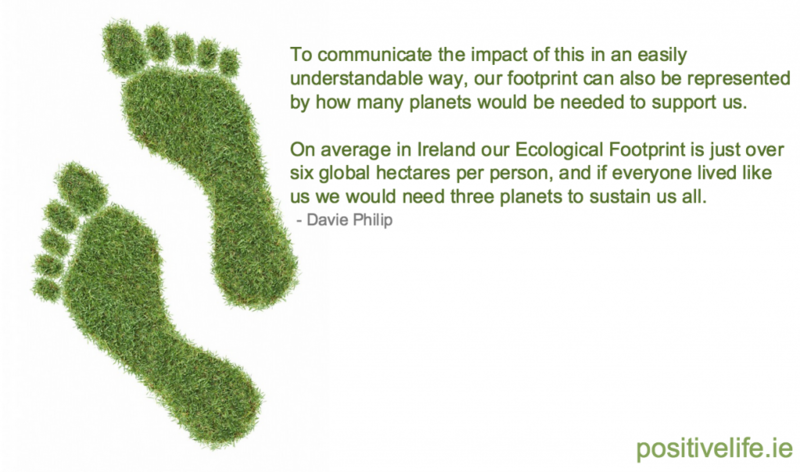 On average in Ireland our Ecological Footprint is just over six global hectares per person, and if everyone lived like us we would need three planets to sustain us all. …Recently, the Cloughjordan Ecovillage, which has 140 residents, had its Ecological Footprint measured by Dr. Vincent Carragher of the Tipperary Energy Agency. Along with the University of Limerick, he has developed a rigorous Community-Based Ecological Footprint assessment tool. The analysis shows that the Ecovillage has a footprint of 2 gHa per person, which is a third of the national average and equates to just over the capacity of one planet. Our objective in having the footprint analysis done was to benchmark our activities and give us a measure that we can work at reducing over time. This was very important to do, as the Ecovillage is now a destination for learning about how a community reduces its carbon emissions and its environmental impact. You would expect us to have a low footprint, with 6.5% of all of Ireland’s ‘A’ rated houses and 2.5% of the ‘B1’s in the Building Energy Rating scheme, our own farm, renewable energy heating district system and a car share club, but one of the surprising reasons for our low footprint was our high level of social cohesion and our ability to work together. With climate change now seen as one of the greatest areas for us all to do better in, we require examples of what can be done to transition to a low-carbon society. To ensure a planet that can sustain life, we need to take immediate positive action to improve health, social, environmental and economic wellbeing. New technologies may contribute, but this will be best done through strong communities that can build resilience and be able to collaborate to reduce consumption, protect and restore biodiversity and learn to live on one planet.